Do you want to learn how some of the top people in their field reached success? Do you want to learn how you can do it too? 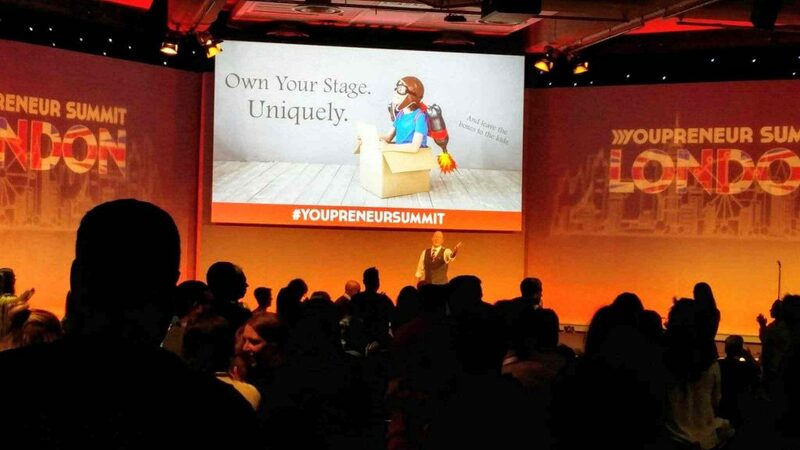 I went to this year?s Youpreneur Summit hosted by Chris Ducker in London. It was a two day masterclass of business tips and inspiration. I have a notebook full of ideas, how-tos, and things I want to do over the next month and year. Here?s a rundown of some of the key things I learned. There are 15 of them, I?m going to throw in another one to kick us off: the theme of the weekend was Charge What You?re Worth. Do it! 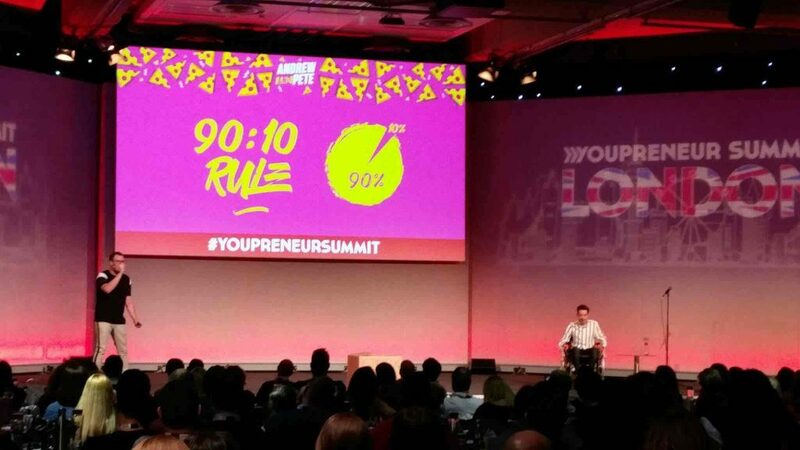 Now read on for my 15 top tips from the Youpreneur Summit 2018. We all have times when we doubt ourselves. And we all compare ourselves to others. We see someone else doing well and think: I want to be like them. I’ve written before about the temptation to follow everyone else. “They’re doing well, we should copy them.” Jenny Flintoft gave a wonderful talk at Youpreneur about Being Uniquely You. We often feel small. We often look around and see lots of other people doing similar things to us. We wonder why would someone choose us? We ask how do we stand out? You have to be you. To do things your way. That’s who people want to do business with. Jenny had a brilliant way of showing everyone that there are enough ways to make ourselves stand out without having to copy others. She said: “There are only seven music notes in the world… I haven’t heard anybody say you know, there’s just not enough music notes. Write or tell your story from the heart. Ignore all other voices (including the imposter on your shoulder). You have music in your soul. Play it. 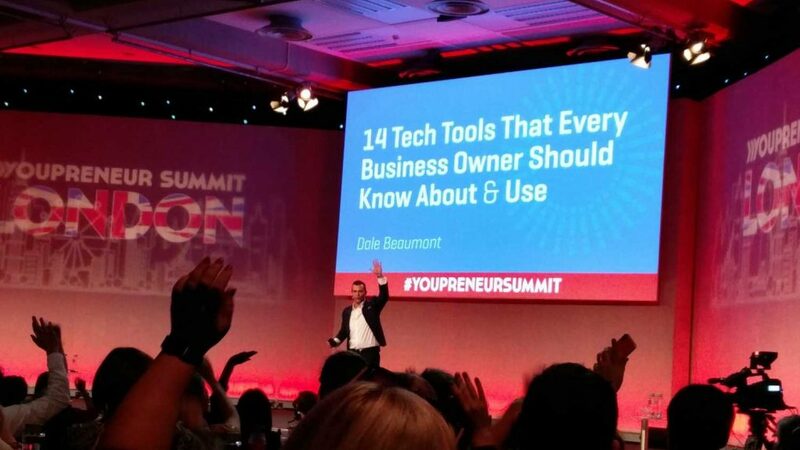 Dale Beaumont gave us a brilliant rundown of tech tools to use in your business. Everything from ways to place your product in a stock image (placeit.net) to Headline Analyser and one of my favourite resources Answer The Public. 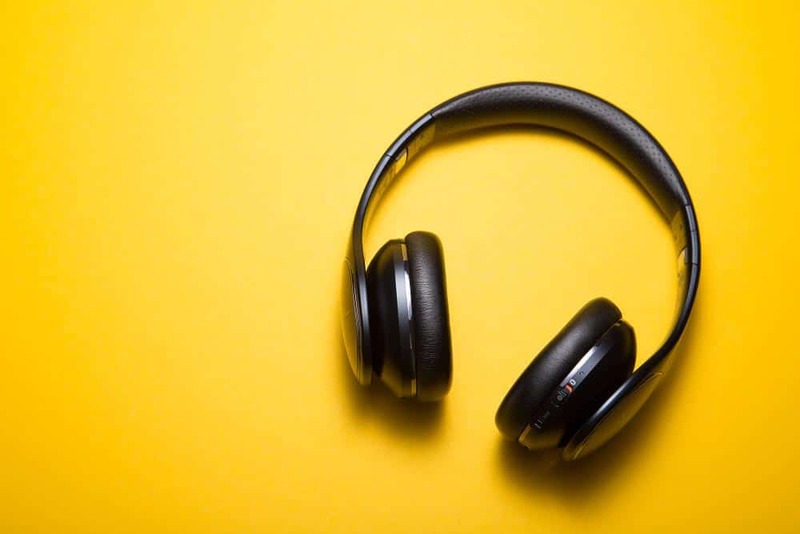 If you’re recording a video or podcast and you repurpose it by transcribing it to create a blog post, you can just set Otter running while you record and the words will be there for you. You can export the text. You can take photos in the app and put them into your text. 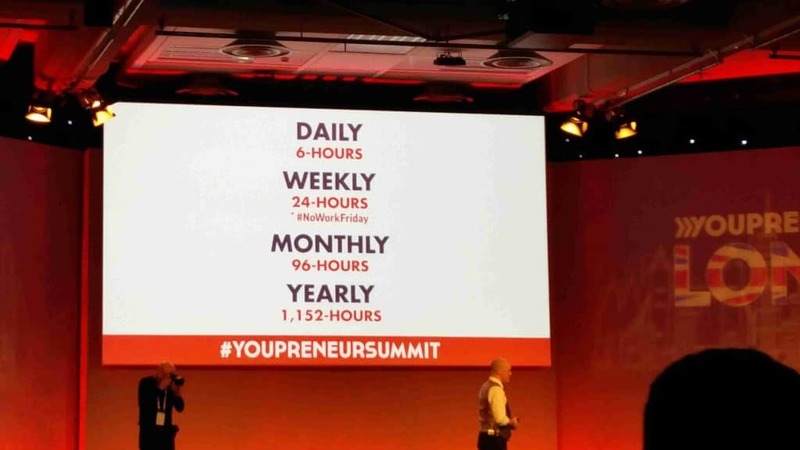 I recorded every talk on day two of Youpreneur Summit using Otter. 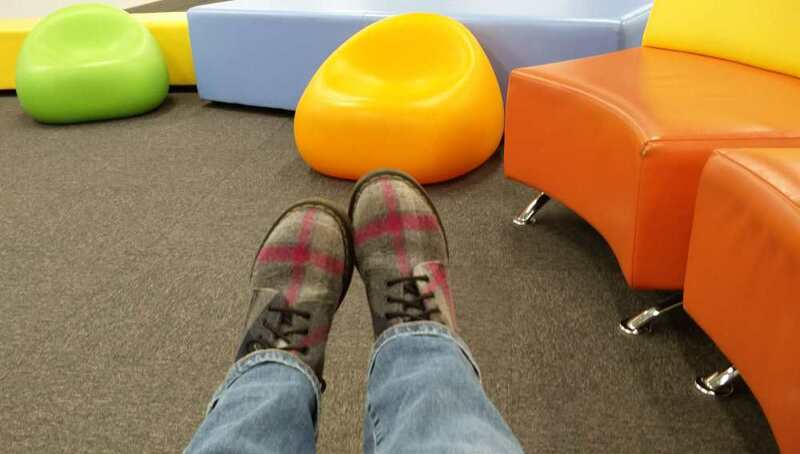 I was sat at the back of the room so it was a pretty hard test. It didn’t get everything but it got most of it, leaving me free to listen without trying to write everything down as well. One of my favourite stories from Youpreneur was told by Roger Edwards during his talk on how to avoid annoying marketing. Roger introduced us to John The Wineman, a door-to-door wine salesman. Like most of us, Roger doesn’t like hard selling techniques. When his wife invited a wine salesman to their home Roger was wasn’t too pleased. John turned up and Roger said clearly that he wasn’t interested in being pressured. John listened. He gave them various wines to try. Roger liked them all and bought several bottles. Over the years John got to know Roger’s tastes and so let him know when products were coming in which he knew Roger would like. The wine was so good that Roger told his friends about it on Facebook. Roger didn’t know which company John worked for and it didn’t matter. What mattered was he liked the service and he liked the product. Listen to your customers. Get to know them. Understand what they want. They will do your marketing for you. John The Wineman’s first-class personalised service got Roger talking about him. Jay Baer, the summit’s closing keynote speaker, has just written a book with Daniel Lemin called Talk Triggers all about getting people to talk about your business. “The best way to grow your business is for your community to do it for you,” Jay explained. 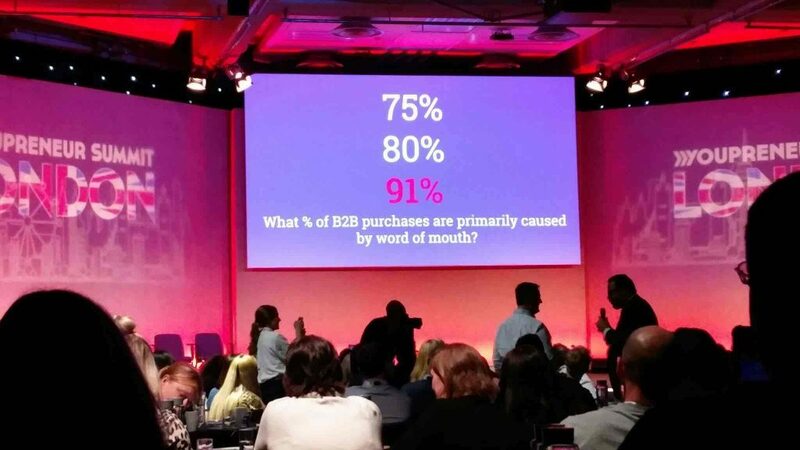 Word of mouth accounts for 50% to 91% of sales. Yet most people don’t have a plan for how to get people to talk about them. Nobody shares stories about things which don’t stand out. Remarkable – something which makes people take notice. Repeatable – you have to be able to do it for everybody. Reasonable – people don’t trust over the top offers. Relevant – give your customers something they want. A talk trigger should not be a stunt. Stunts are one offs. They get people talking, yes but only for a little bit. “Surprise and delight is a stunt not a strategy,” Jay Baer said. People will encounter your talk trigger for the first time but word gets around. That’s why it works. Everyone will expect to get the same service when they come to you. If your talk trigger is a big giveaway or that someone gets a particular experience, you cannot make that repeatable and it?s unlikely to be reasonable. Stunts have their place in marketing. But they are not an every day part of your business. Get your business talked about because you consistently make people smile. 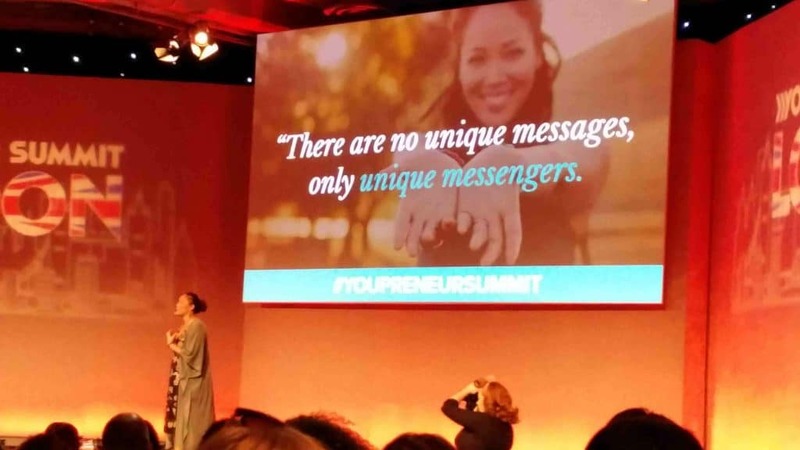 A key message from lots of the talks about Youpreneur Summit were about making things simpler. I’m as guilty as anyone of assuming I need to have lots of different things in place. But the simpler you make your business, the easier it is for you and the clearer it is for people who want to buy from you. My next three highlights are a trio of ways you can simplify your business (and your life). Are you struggling to get things off the ground? Greg Hickman from system.ly kicked off day two of the summit by explaining how to create funnels which convert. His top tip: focus on ONE thing. Greg said that what often stops people from getting their sales process live is that they make it too complex. Greg’s advice is to “start simple, get ninja later” (if you have to). Come up with one thing you can do that your customers need right now. 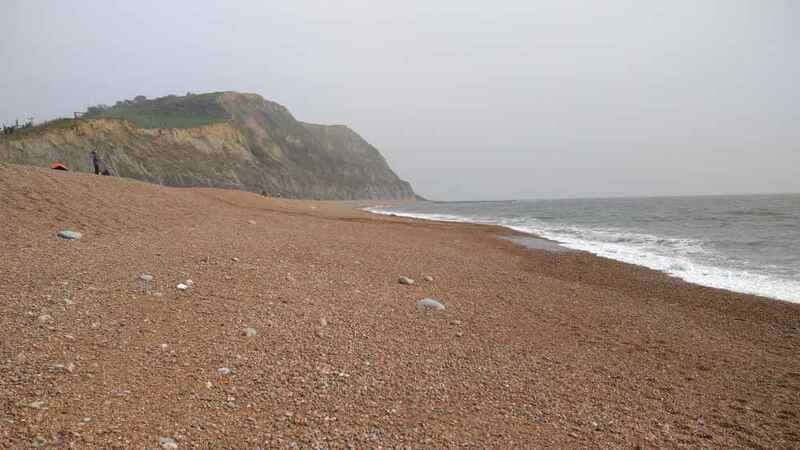 Then think about your customer journey: adverts – leads – prospects – clients. Focus on that one thing. Answer people’s questions, deal with their objections, make sure it is right for them and that they are the right customers for you. Social media has so many platforms and types of content it makes your head spin. You’re busy creating videos, blogs, upload pictures, not to mention doing what you should be on social media: being social. 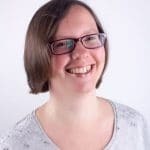 Our businesses are often on at least three different platforms and we’re looking at the ones we’re not using wondering if we should be there too. But how much of this activity is actually benefiting you? Andrew and Pete, who put on a brilliant show on Sunday afternoon which had everyone in fits of laughter, say STOP! Focus on one thing and spend 90% of the time you have for content marketing doing that. It doesn’t matter what you pick but make it your own. Make it remarkable. Make people want to see it, read it or watch it. Make them look forward to it. Look at where you are getting engagement and what people are reacting to. Then focus on doing more of that. They said: “When you find the reaction spikes, you can lean into them confidently. 9. Get off the hamster wheel! 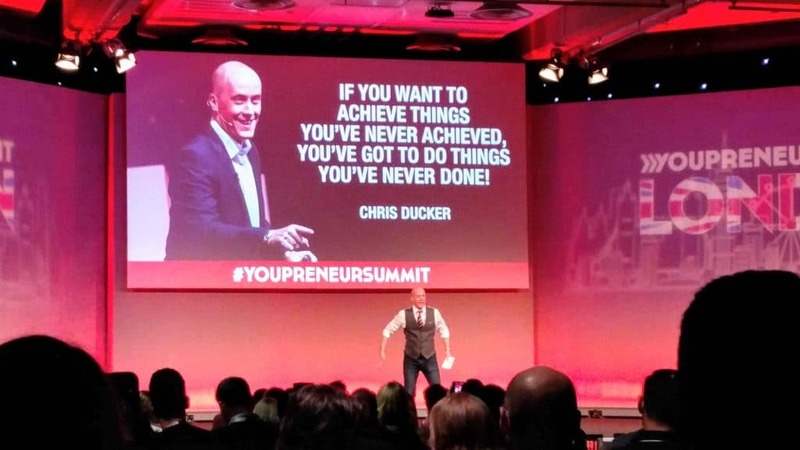 Chris Ducker spoke about the importance of having a life as well as a business. You don’t need to work stupid hours to build your business. It’s bad for your health and you lose sight of what’s important if you’re constantly on the hamster wheel. Chris works six hours a day, four days a week. Oh yes. Now there’s life goals for you! You’re putting the groundwork in. Your actions now will reap rewards in a year and a half to two years. That’s a lot of time to have self-doubts. Remember, someone wants to dance to your tune. They’re just getting their dancing shoes ready and picking the moment to take to the floor. Can you ride a bike? How many times did you fall off when you started out? I’m betting you couldn’t do it instantly. It’s the same with business. You have to learn the ropes. “If you’ve made 100 videos you’ve done the reps you show up to the gym,” Antonio said. Whatever you are doing in your business, you need to keep putting the work in. You need to show up. It takes time to build an audience and a community. Stay the course. The weekend started with the wonderful Carrie Wilkerson, the Barefoot Executive, talking about building a strong personal brand. She spoke about the need to focus on “people, path and purpose”. Follow the path. That course you are on, the one where you are putting the groundwork in, building your community, plugging away, showing people who you are, what you do and why, that path is vital to your success. Carrie said: “Dorothy didn’t know how she was going to get home but she knew if she followed the path she would make it to Oz. This is the one which scares me the most. But being bold gets you places. Making that call. Seeking out that person you want to talk to. Writing down an ambitious goal. Putting on that first event or starting that podcast. Whatever it is that you want to do, being brave and going out there is what makes the difference. 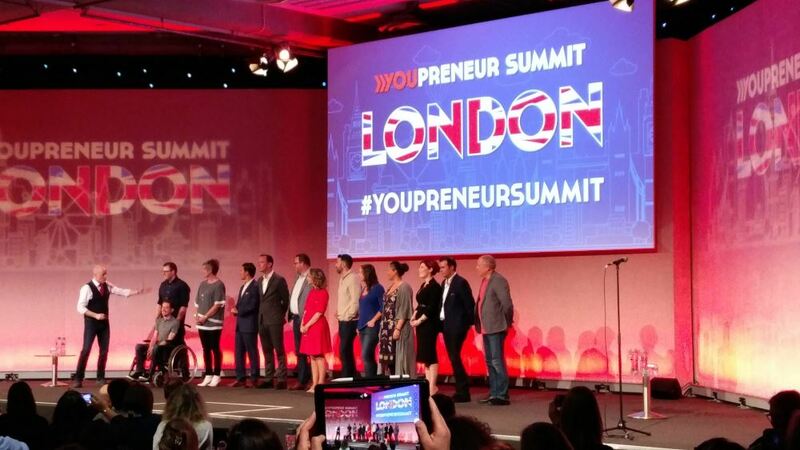 Everyone who took to the stage during Youpreneur Summit had the guts to be bold. They took a leap. They asked for help. They challenged themselves to achieve and inspire. And they help others. They also had the guts to get up on that stage. From the speakers who had keynoted all over the world to the people who were taking it for the first time. And then there were those who had bought a ticket and were willing to go on stage, tell their stories and ask questions. Thank you to everyone who went on stage and shared their knowledge and experience during the weekend. When we talk about people in our businesses, we tend to mean our customers and our colleagues. But your people are a much wider circle than that. And it starts with the people who have always been there for you. Your family. Your friends. These are the most important people. They are cheerleaders for your success. And as this blog has already discussed, we need people to push us on, who love us as ourselves, who see us in ways we don?t and can point out things we’ve overlooked. There’s a great TED talk about creating a movement. Day two of the Youpreneur Summit began with a mass boogie. Don’t Stop Me Now was playing. Then some of the speakers started dancing at the back of the room as Chris Ducker came in. Suddenly the stage was filled with people dancing. More and more people ran on to be a part of it. If you’re going to create a movement, you need that first follower because they tell everyone else, it’s ok to join in. I had an absolutely brilliant weekend at Youpreneur Summit. I’d love to know which things you’ll be using in your business and life. If you were at the summit, let me know your top takeaways. Great summary Rachel – look forward to seeing you next year! Thanks for reading Antonio. You gave a truly inspiring talk. Thank you. This is a great summary of the event. I loved it too! Bring on next year’s event already! Thanks Amy, it was a brilliant weekend.